Chili Peppers are widely used for Mexican and African cooking. 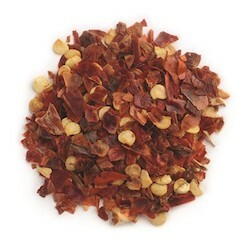 Red Chili Pepper Flakes are made from hot dried red peppers and give a wonderful kick to any meal. Can be sprinkled sparingly in marinara sauce, pizza sauce, soup, on grilled vegetables and more.